Recently, many airlines have picked up the Air New Zealand Skycouch concept. While China Airlines introduced “Family Couch” and Azul introduced “Sky Sofa”, Air Astana is now becoming the latest carrier to introduce a similar yet slightly different product. The Kazakh airline is announcing the new “Economy Sleeper Class”, in which each passenger will get to enjoy a row of three Economy Class seats, turn-down service, along with various privileges at the airport. 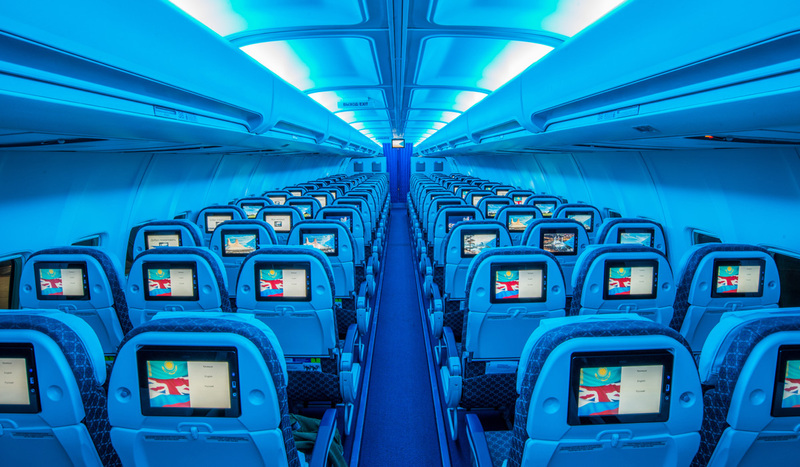 The new class type, with up to 12 seats available each flight, will be featured exclusively on the Boeing 757-200 and will debut in February on routes from Astana to London, Frankfurt and later Paris. The Economy Sleeper Class is located in the first few rows of Economy Class. The area, similar to Premium Economy products on other carriers, is partitioned from the regular Economy Class and therefore allows passengers to enjoy more privacy. During in-flight, Business Class amenity kits will be provided to make traveling more comfortable. As for the in-flight entertainment, KC-TV iPads, with movies, music and games, will be handed out. If the 757 is retrofitted and offers PTV, KC-TV iPads will still be offered so that passengers can have access to entertainment whenever they desire, even when they are lying down. When it is time to rest, the cabin crew will bring mattress layers, luxurious duvets and pillow sets to transform seats into beds that can allow passengers to sleep soundingly. 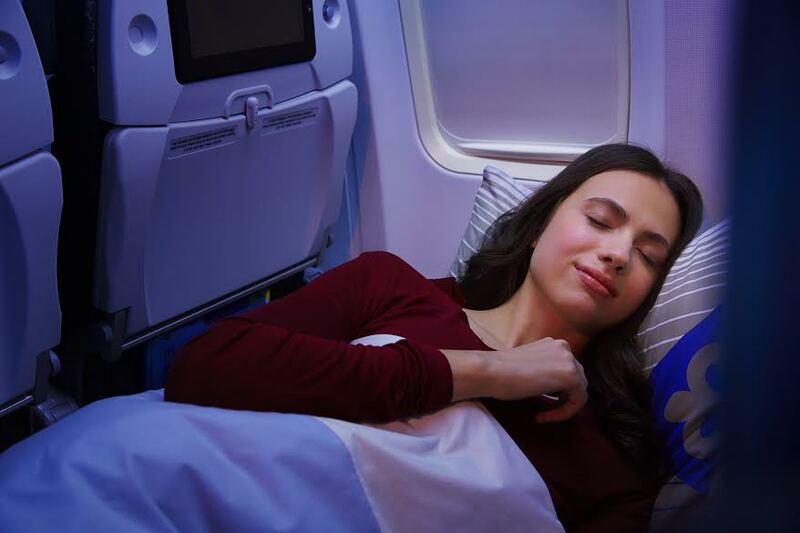 With the new Economy Sleeper, Air Astana is targeting families who want more space and passengers who are unable to book business class seats. On February 3rd, the Economy Sleeper will debut on flights between Astana and London Heathrow, Frankfurt. Flights between Astana and Paris will have the Sleeper product as early as March 29th. >talkairlines applaud Air Astana for introducing this interesting new product. While the hardware, not as exciting as that of Skycouch, is slightly disappointing, we are amazed by the priorities and additional offerings that come with the product. We also love how the class, with Business Class amenity kits and partitions that separate it from Economy Class, is the first to blend the Skycouch and Premium Economy concepts. As Air Astana will be receiving its first Boeing 787-8 in 2019, we hope to see the carrier introducing even more exciting products, perhaps a revolutionary bed-like Economy Class that surpasses both the current Sleeper product and the Skycouch. >talkairlines wishes the best to Air Astana and hopes that it can continue leading the progress of Central Asian aviation with its award-winning services and products. EXTRA: Want to check out what another Central Asian carrier, Azerbaijan Airlines, is offering on its Boeing 787-8 Dreamliners? Click HERE. On a recent trip to Australia from Bangkok, I had a trio of seats on TG’s B777 and tried sleeping. Not sure if for the price of a couple of economy seats, it wouldn’t just be better to pay for biz and get a true lie-flat seat. Previous Previous post: China Eastern Chatbot Flight Takes Off: Will “XiaoIce” Raise In-Flight Services to Unprecedented Levels?